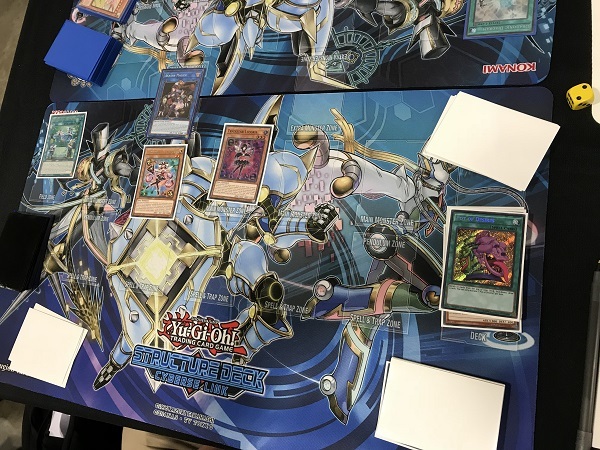 Our Round 6 Feature Match is at Table 6, as we’re taking a look at Logan Johnson from Seattle, Washington with his Trickstar Deck with a heavier Trap lineup including Heavy Storm Duster and Blazing Mirror Force taking on Tyler Nethercott from Reno, Nevada and his True Draco Deck. Currently they’re both undefeated, but which one will remain that way after this Round? It’s time to Duel! Johnson won the roll and elected to go first. He started with a hand of Trickstar Candina, Terraforming, 2 copies of Droll & Lock Bird, and Heavy Storm Duster. He activated Terraforming to add Trickstar Light Stage to his hand and activated it to add Trickstar Lycoris from his Deck to his hand. He then Normal Summoned Trickstar Candina and activated the effect to add Trickstar Reincarnation to his hand. He Set Trickstar Reincarnation and Heavy Storm Duster, Special Summoned Lycoris by returning Trickstar Candina to his hand, and passed. Nethercott drew and took 400 damage thanks to Trickstar Lycoris backed by Trickstar Light Stage. He Normal Summoned Amano-Iwato. He then activated Terraforming to add Dragonic Diagram to his hand and took another 400 points of damage. (Lycoris’s effect doesn’t activate, so Amano-Iwato couldn’t stop it.) Johnson didn’t activate Trickstar Reincarnation just yet. Nethercott activated Dragonic Diagram, Set a card to the back row, then Set another one, then a third, then a fourth, then finally activated Dragonic Diagram’s effect; but Johnson chained Heavy Storm Duster, destroying it and a blind face-down which was True King’s Return. The Trap effect destroyed Johnson’s Trickstar Lycoris. Amano-Iwato attacked directly then returned to Nethercott’s hand in the End Phase. Johnson drew another Trickstar Light Stage for his turn. He used the Field Spell effect to freeze Nethercott’s right-most Spell/Trap. Johnson then Normal Summoned Trickstar Candina. He used the effect to add Trickstar Lilybell to his hand, and Lilybell’s effect let Johnson Special Summon it. He then activated another Trickstar Light Stage and used the effect to search for another Trickstar monster. He then used the Light Stage effect to freeze the same Spell/Trap. He then had Lilybell attack directly and add Trickstar Lycoris from the Graveyard back to hand. Trickstar Candina attacked directly, then Lycoris swapped places with Trickstar Candina and Lycoris attacked directly leaving Nethercott at 2400 LP. In Main Phase 2, Johnson Set Trickstar Reincarnation and went to the End Phase where Trickstar Light Stage’s effect forced True Draco Apocalypse to be activated. Nethercott drew a card and took another 400 points of damage. 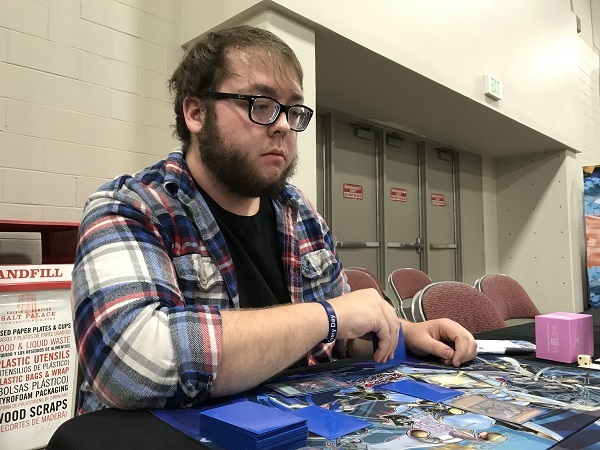 Johnson activated one of his Trickstar Reincarnations to force Nethercott to banish Amano-Iwato and Ignis Heat, the True Dracowarrior to draw another 2 cards and take 600 points of damage. After the Chain resolved, Johnson activated the second Trickstar Reincarnation, then Chained Droll & Lock Bird to force Nethercott to banish his hand and draw no cards. At this point, Nethercott conceded the Duel to go to the second one. Nethercott elected to go first in Duel 2. He Set 4 cards to the back and then activated Card of Demise to draw 3 cards. He activated Pot of Duality, revealing True Draco Apocalypse, another Duality, and a Master Peace, the True Dracoslaying King. He picked Master Peace, the True Dracoslaying King to add to hid hand, shuffling the other 2 cards back into his Deck. 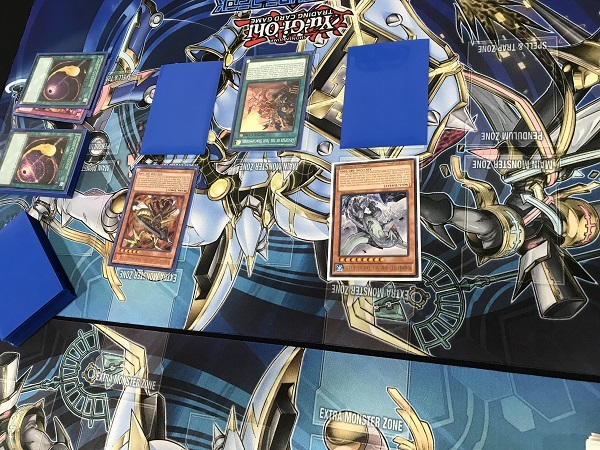 He activated Dragonic Diagram and used the effect to destroy his Set True King’s Return and add True Draco Heritage from his Deck to his hand. He activated Heritage, then used the effect to draw a card. He Set a fifth Spell/Trap, then Tributed a face-down True Draco Heritage and True Draco Apocalypse to Tribute Summon Master Peace, the True Dracoslaying King. In Johnson’s Standby Phase, Nethercott activated Anti-Spell Fragrance. Johnson Set a monster and 5 Spell/Traps and passed. 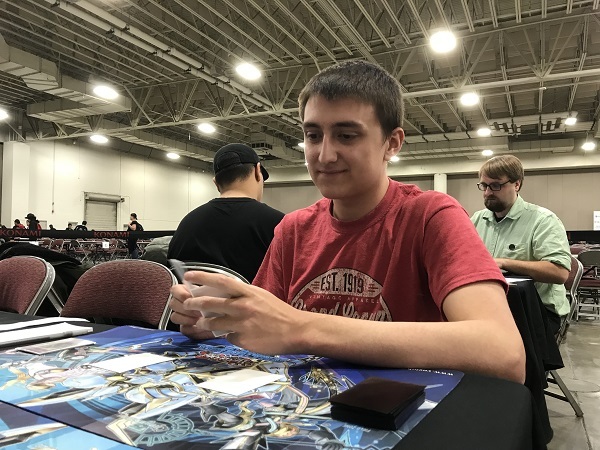 Nethercott drew for turn, but Johnson activated Trickstar Reincarnation immediately to force Nethercott to banish the True Draco Apocalypse in his hand for another card. Nethercott then used Dragonic Diagram’s effect, destroying his Set Disciples of the True Dracophoenix to add Ignis Heat, the True Dracowarrior to his hand. He used Disciples’s effect to destroy a face-down Torrential Tribute. He then Tributed his Set The Monarchs Erupt to Tribute Summon Ignis Heat, the True Dracowarrior. He attacked with both monsters, dropping Johnson down to 2350 LP. In Main Phase 2, Master Peace’s effect destroyed Johnson’s Set Blazing Mirror Force. Johnson drew Heavy Storm Duster for turn. He activated his Set Pot of Desires, banishing 10 cards as a cost. Nethercott used Ignis Heat’s effect to add True Draco Heritage to his hand. Pot of Desires drew Johnson Gameciel, the Sea Turtle Kaiju and Droll & Lock Bird . He Tributed Nethercott’s Master Peace to Special Summon Gameciel, the Sea Turtle Kaiju to Nethercott’s field! He then Normal Summoned Droll & Lock Bird, then Link Summoned Linkuriboh! He Set Heavy Storm Duster and passed. Nethercott drew for turn. He Set a card to the back row and activated Dragonic Diagram’s effect. Johnson Chained Heavy Storm Duster destroying Diagram and Anti-Spell Fragrance. 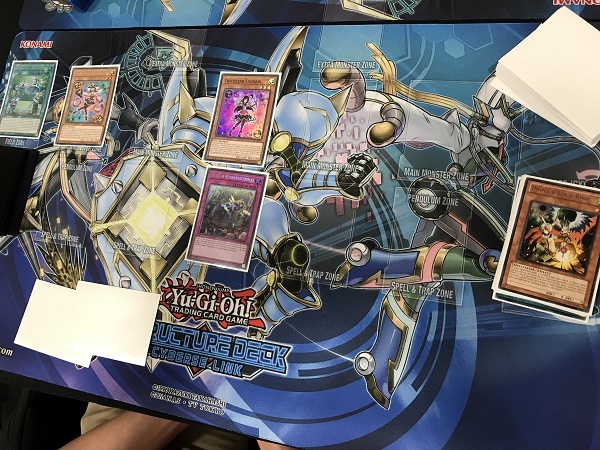 Nethercott then activated his Set Cosmic Cyclone, targeting the last Set card on Johnson’s field, which Johnson Chained: Trickstar Reincarnation. Gameciel, the Sea Turtle Kaiju attacked into Linkurboh whose effect activated, Tributing itself to reduce Gameciel, the Sea Turtle Kaiju’s ATK to zero. Johnson conceded anyway to go to the third Duel. “I banished 3 Trickstar Candina and 2 Trickstar Light Stage off that Pot of Desires! And my starting hand was two Trickstar Reincarnation and Trickstar Lilybell!” remarked Johnson. Johnson elected for Nethercott to start the third Duel. Nethercott started off with Amano-Iwato, then activated Pot of Duality, revealing another Duality, True Draco Apocalypse, and another Amano-Iwato. He picked the True Draco Apocalypse and shuffled the others back. He Set 3 to the back and passed, taking back Amano-Iwato. Johnson drew and Nethercott had the Anti-Spell Fragrance again. Johnson Normal Summoned Trickstar Candina and activated her effect to add Trickstar Reincarnation from his Deck to his hand. He attacked for 1800, dropping Nethercott to 6200 LP. He Set 4 cards to the back. In Main Phase 2, Nethercott activated his Set True Draco Apocalypse and took 200 damage from Trickstar Candina. He then Tributed it and the face-up Anti-Spell Fragrance to Tribute Summon Master Peace, the True Dracoslaying King. True Draco Apocalypse’s effect destroyed Trickstar Candina. Master Peace’s effect was activated in the End Phase, destroying Johnson’s face-down Torrential Tribute. Nethercott Normal Summoned Amano-Iwato then activated his Set Pot of Duality, revealing Card of Demise, Terraforming and The Monarchs Erupt. After the Chain resolved, Johnson activated Trickstar Reincarnation, forcing Nethercott to banish Card of Demise to draw another card. Amano-Iwato and Master Peace, the True Dracoslaying King attacked directly, leaving Johnson at 3150 LP. Amano-Iwato bounced back to Nethercott’s hand in his End Phase. Johnson flipped his Set Terraforming to add Trickstar Light Stage from his Deck to his hand. He then activated it, but Nethercott Chained his Set Cosmic Cyclone – dropping to 5000 LP – banishing the Light Stage. He activated the Terraforming from his hand to add another Trickstar Light Stage and tried to activate it, but Master Peace blasted it away. Trickstar Candina came down next, using its effect to add the third Trickstar Light Stage from his Deck to his hand. It was activated and this one went through, adding Trickstar Lycoris from his Deck to his hand and freezing Nethercott’s last Set card. In the End Phase, Nethercott’s Set Pot of Duality was sent to the Graveyard. Nethercott Normal Summoned Amano-Iwato. Amano-Iwato attacked into and destroyed Trickstar Candina and Master Peace brought Johnson down to just 100 LP! Johnson Tributed Nethercott’s Master Peace for Kumongous, the Sticky String Kaiju! He banished the Trickstar Reincarnation in his Graveyard to Special Summon Trickstar Candina then used Trickstar Lycoris to swap places with it. Trickstar Candina was Normal Summoned and added another Trickstar Reincarnation from his Deck to his hand. He used both monsters to Link Summon Akashic Magician! He used its effect to bounce the Kumongous, the Sticky String Kaiju he had Summoned to Nethercott’s second Main Monster Zone (directly in front of one of the Extra Monster Zones) back to his own hand! He attacked with the Magician, leaving Nethercott at 3300 LP. He Set Trickstar Reincarnation and passed. His other face-down was Solemn Judgment. Nethercott Normal Summoned Amano-Iwato and Johnson activated Solemn Judgment! He dropped to 50 LP to negate the Summon! Nethercott followed-up with Terraforming for Dragonic Diagram. Diagram was activated. destroying Majesty Maiden, the True Dracocaster from his hand and adding True King’s Return from his Deck to his hand. Johnson contemplated activating the Set Trickstar Reincarnation, which he did, banishing True King’s Return for another random card. Nethercott passed. Johnson topdecked and activated Pot of Desires, banishing the top 10 to draw 2 cards, both Scapegoat. He Normal Summoned Trickstar Lilybell and attacked with both Akashic Magician and Trickstar Lilybell. Lilybell’s effect added back Lycoris which swapped places with Lilybell, and Lilybell’s effect Special Summoned her back to the field. That was enough to reduce Nethercott’s Life Points to zero! Logan Johnson keeps his undefeated record alive! Round 7 Feature Match: Denny Yu vs. John Goad QQ: Which Card Art Would You Put On A New Game Mat?